Need A Dental CT (CBCT)? Losing teeth significantly affects your ability to chew and eat your favorite foods. Often, people change to softer diet or avoid chewing on one side or the other to compensate for this loss. Tooth loss, especially in the upper front area of your mouth also known as the smile or aesthetic zone, compromises your smile. People with missing teeth or aesthetically unpleasing teeth often cover their mouth when talking or smiling. It can also affect one’s speaking. Following teeth loss, the remaining teeth have to carry the ‘load’ during your chewing. The excessive forces can result in chipping, fractures, or potential gum disease with loss of bone. 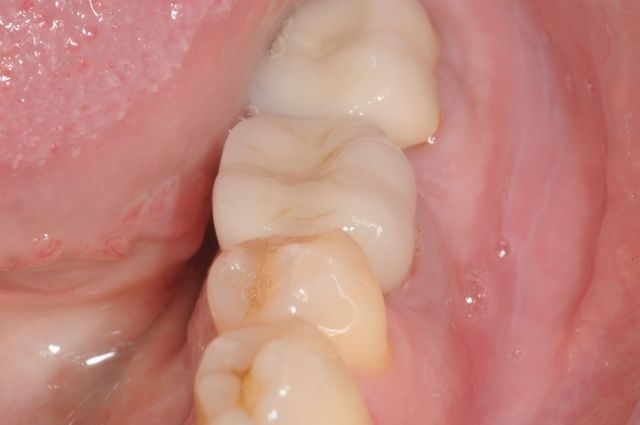 Once the bite has been compromised by tooth loss, it becomes increasingly worse as the other teeth suffer such damage and begin to shift. Following tooth loss, the supporting jaw bone undergoes significant remodeling and shrinkage. This will result in defects that are unsightly, difficult to clean, and difficult to correct later. This can easily be prevented by replacing the missing teeth with implants early. Tooth loss causes shifting or moving of adjacent and opposing teeth. The back teeth begin to tilt forward and the opposing teeth start shifting up or down. All of this results in malocclusion (poor bite), increase in teeth fractures and increased bone loss (periodontal disease). 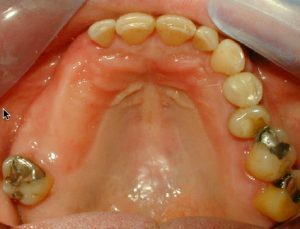 Once teeth have shifted, correction is difficult and costly. 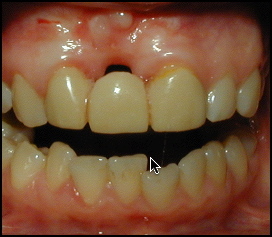 It is best to replace missing teeth before such changes occur. 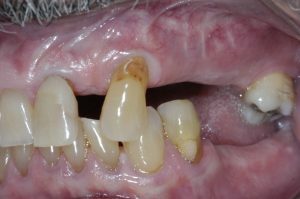 Loss of many teeth in the back results in ‘bite collapse’. The jaw then over closes putting more pressure on the front teeth causing them to flare out. Facial wrinkles develop around the mouth and the lips start to pouch outward (This is the classic tooth-less aging person look). Some people also begin to develop facial pain and TMJ problems. These are serious permanent changes which can be easily prevented by replacing missing teeth in a timely fashion. Having a healthy mouth and nice smile greatly contributes to one’s sense of self-esteem and comfort in social settings. We have met many patients whose lives greatly suffered from oral health negligence. Overall quality of life is enhanced with replacement of teeth that look, feel and function like natural teeth. Whether you are replacing a tooth that is already missing or needs to be extracted, or replacing an old defective bridge, dental implants offer the only viable option for long term success. Conventional dental bridges are not recommended for replacement of missing teeth due to many associated problems, relatively short life-span, and irreversible damage to the teeth holding them. Cost difference between a dental bridge and dental implant. 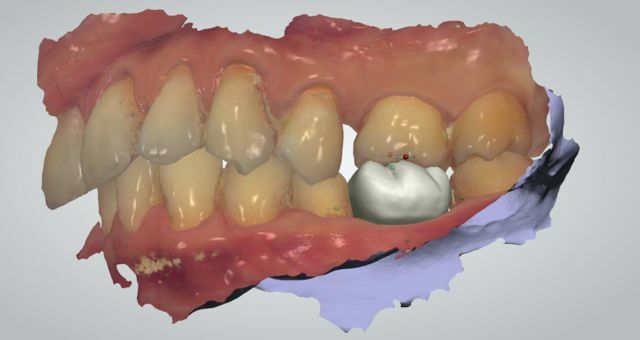 Six reasons why your dentist may recommend a bridge over dental implants. Success rates for implants do not decrease over time. Compare this to the success rate for bridges, which decreases steadily after 10 years. In fact at 15 years one to three bridges typically fail. By replacing the entire tooth, including the root, it is possible to replicate the function of natural teeth, with a strong, stable foundation that allows comfortable biting and chewing. In addition, nothing in the mouth looks or feels artificial. With dental implants, adjacent teeth are not compromised to replace missing teeth. 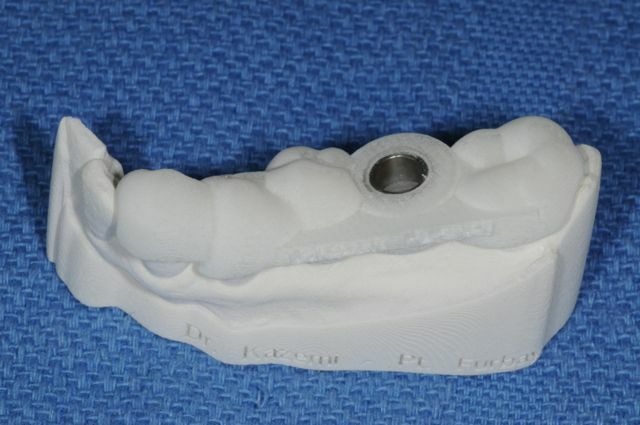 Tooth replacement with traditional tooth-supported bridges requires grinding down the teeth adjacent to the missing tooth/teeth, so that the bridge can be cemented onto them. 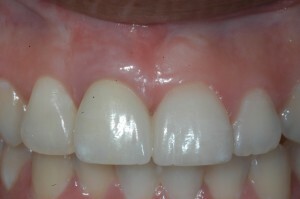 This tooth structure can never be replaced and the long-term health of these teeth is compromised. Partial dentures have clasps that hook onto adjacent teeth, putting pressure on them as the partial rocks back and forth. Eventually these teeth can loosen and come out as a result of this pressure. Replacing missing teeth with implant supported crowns/bridges does not involve the adjacent natural teeth, so they are not compromised or damaged. Overall quality of life is enhanced with replacement teeth that look, feel, and function like natural teeth. With implant supported replacement teeth, the appearance of the smile is more natural, and the teeth function more like natural teeth. The result is increased comfort and confidence when smiling, speaking, and eating. If dentures and partials are replaced with implant supported teeth, the overall enhancement in quality of life is even more significant, with an ability to eat all types of foods, elimination of messy adhesives, and improved speech, comfort and appearance. It is much easier to care for an implant supported crown, which can be cleaned like a natural tooth. In comparison, a tooth-supported bridge requires the use of a floss threader for proper cleaning. It is also more convenient to clean a full set of implant supported replacement teeth than a traditional denture. Since implants preserve bone, preventing deterioration of the facial structures, appearance is improved. 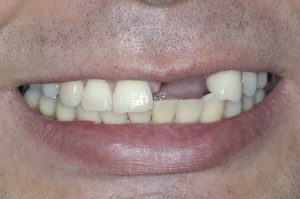 Collapse of the lower one-third of the face caused by complete tooth loss can be visually corrected and the remaining bone preserved. The appearance of wrinkles around the mouth caused by posterior bite collapse, or complete facial structure collapse is virtually eliminated. Many of the people who now enjoy the benefits of implant supported replacement teeth state that their self esteem and self confidence have been restored as a result of improved appearance, function, comfort, and health. Dental implants are made of completely biologically compatible “bone-friendly” titanium material, that naturally heals and integrates with the surrounding tissues. Because titanium is accepted so well by the human body, it is also used for orthopedic implants, such as hip and knee replacements. Dental implants are very safe and predictable, and complications can be avoided when performed by a trained, skillful, and experienced oral surgeon using specialized instruments and techniques. Dr. Kazemi specializes in dental implant placement and has performed it successfully on thousands of patients. Our office is designed and equipped for dental implant procedures, and the team assisting Dr. Kazemi is trained specifically for them. Methodical, exacting, and detailed protocols are followed strictly to make sure every patient is safe and has a pleasant experience. Dental implants should not be done until the patient has completed their growth, typically age 16 to 17 in females and 18 to 21 in males. 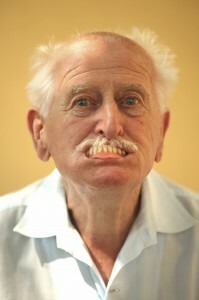 Some older patients fear their jaw bone is too weak. The fact is dental implants are equally successful and have an excellent prognosis in any adult patient. No one is too old for dental implants, and for many, improvement in chewing and aesthetics adds confidence and quality to their lives. Implants have been done successfully in patients over 85 years old. Osteoporosis does not affect the health of the jaw bone, and dental implants are equally effective and successful. Can Dental Implants be Rejected? Rejection does not occur with dental implants. Our overall success rate for dental implants is 99% with almost 50 years of clinical research to back them up. Because implants are made of biologically compatible “bone-friendly” titanium material, they naturally heal and integrate with the surrounding tissues. The jaw bone undergoes significant shrinkage following the third month after tooth loss and can continue up to 12 months. 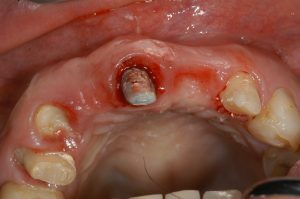 If the extraction site was not grafted at the time, there might be an inadequate amount of bone for implant placement. Bone grafting is a highly successful and predictable treatment option to augment missing bone and build a proper foundation for the necessary implants. Studies show an increased risk of complications if patients smoke during the initial phases of implant healing. However, once healed and integrated, there is good long term success. It is advised to stop smoking for 2-3 months following dental implant placement for optimal results. Uncontrolled diabetes: Patients with diabetes may successfully have dental implants as long as they are well controlled. Patients with uncontrolled diabetes can experience poor healing and implant failure, therefore, should seek medical care prior to implant placement. Extractions, grafting, and implants are quite safe and predictable and complications can be avoided when the procedure is performed by a trained, skillful, and experienced oral surgeon using specialized instruments and techniques. Dr. Kazemi specializes in these procedures and has performed them successfully on thousands of patients. Our office is designed and equipped for such surgical procedures, and the team assisting Dr. Kazemi are trained specifically for them. Methodical, exacting, and detailed protocols are followed strictly to make sure every patient is safe and has a remarkable experience. Dental implants are made of biologically compatible “bone-friendly” titanium material that naturally heals and integrates with the surrounding tissues. Because titanium is accepted so well by the human body, it is also used for orthopedic implants, such as hip and knee replacements. Teeth replacement with dental implants requires the collaborative efforts of a surgeon and a restorative dentist and dental laboratory. Dental implant surgery is a highly skilled discipline, best performed by oral surgeons who are well trained and perform this procedure daily. Dr. Kazemi specializes in dental implant placement and has performed it successfully on thousands of patients. The prosthetic aspect (crown, bridge, etc.) is performed by your restorative dentist who may be a general dentist or a prosthodontist, a specialist trained in more complex aesthetic and reconstructive restorative dentistry. Majority of dental implants used currently in dentistry are made of Titanium. 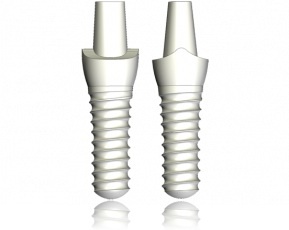 Ceramic dental implants are also available as the newer ‘non-metal’ form of implant. They are both available in many sizes and lengths depending on the location and quality of the site. Most commonly and researched dental implants used currently are made of Titanium which is a bio-inert and bio-compatible material. It is accepted by the jaw bone and heals very predictably. Titanium implants have been in use for many years and are both safe and long-lasting. A newer type of dental implants made of Zirconia are also available. Zirconia dental implants, marketed as ‘meta-free’, are alternatives to Titanium implants, however there are no long term studies regarding their efficacy or success. 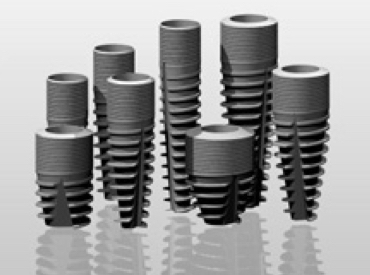 We provide both types of dental implants, although over 99% are Titanium. If you need dental implants to replace your missing teeth and for whatever reason do not want ‘metal’, you may consider ‘ceramic’ dental implants as an alternative. Ceramic dental implants, specifically known as zirconium or zirconia dental implants, are one of the newer forms of dental implants in the market as an alternative to titanium dental implants. What are zirconia ceramic dental implants? Zirconia was discovered in 1789 by the German chemist M. H. Klaproth but rediscovered only in the last decades because of its unique properties. Zirconia is a very hard material and has great strength. Because of its high bio-compatibility, it is used in medicine (auditory, finger and hip prostheses) and dentistry (posts, crown and bridge restorations, implants, implant abutments). Zirconia has similar color to teeth and is bio-compatible making it an alternative material in dentistry. Zirconia dental implants were approved by FDA in 2007 and have very limited scientific studies in United States. They have been used mostly in Europe with short term studies. Used over 20 years in medicine, mainly for prosthetic joints, with good success. Gum tissue-friendly material with low plaque retention and inflammation. Since zirconium is white and more similar to the color of natural teeth, it may have aesthetic advantages over titanium. In rare event of gum tissue recession or shrinkage, ceramic dental implants will not reveal gray lines like in the case of titanium implants. 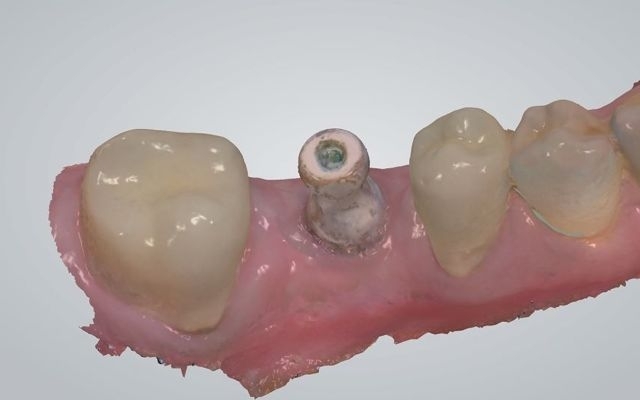 However, it should be pointed out that similar remarkable aesthetic results can be achieved with titanium implants if they are used along with ceramic abutments and crowns. Risks with Ziconia ‘ceramic’ implants? Zirconium dental implants are one-piece structures and can only work in one position, unlike a two-piece titanium dental implants that offer more flexibility in their angle through use of custom abutments. 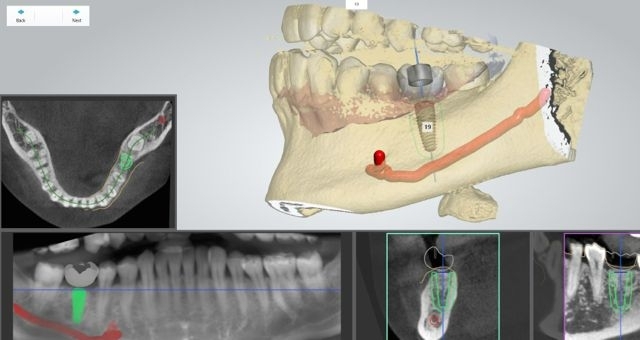 Therefore ceramic implants must be placed with extreme caution and attention to orientation and angle. There are reported non-integration and fractures and there are no long term studies to support their efficacy and longevity in the literature. The existing research is limited and very short term. Zirconia implants may be subjected to hydrolysis (a physiological process) whereby they can absorb water and potentially become more prone to fracture. Although the initial studies are favorable, more investigations are in progress. 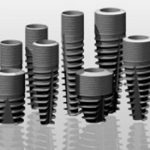 Ceramic vs titanium dental implants? Titanium is regarded as the ‘gold standard’ for dental implant materials. Numerous studies have affirmed the high success and survival rates of titanium implants providing 98% + success rate. Zarconia ceramic dental implants have only about 5 years of research and limited reports in the literature. Although they show favorable preliminary results, their long term success is unknown. Titanium implants demonstrate high degree of integration with the bone and have excellent long term prognosis and success. The long term integration properties of zarconia remains unknown. 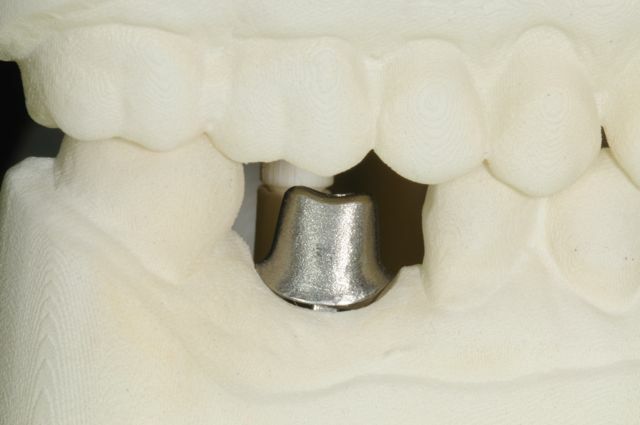 Some suggest that zirconia implants have aesthetic advantage over titanium implants. 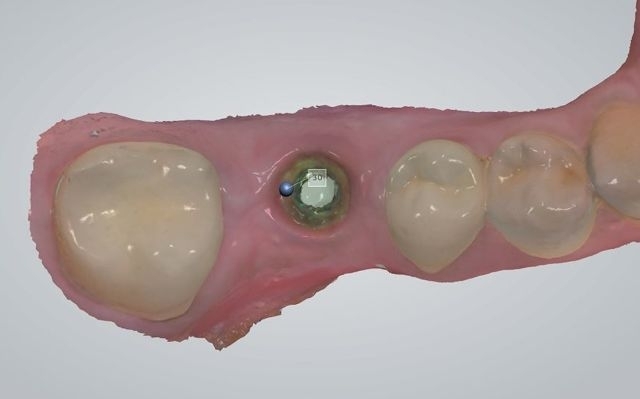 However, when replacing teeth in the smile zone, most clinicians use zirconium abutments and crowns in conjunction with titanium implants, providing great aesthetic outcomes. If the gum tissue is very thin, then titanium’s gray shadow may become more visible. This potential aesthetic complication can often be avoided by proper implant site tissue development, proper placement of implant, and choice of ceramic abutments and crowns. Zarconia implants may not be possible to use in every patient, whether it is because of position, bone quality and quantity, and functional qualities. Successful and predictable replacement of your missing teeth with dental implants requires a carefully planned treatment plan coordinated by the oral surgeon and your restorative dentist. There are many factors that must be evaluated during the planning phase to make sure the results meet your expectations and provide you with long-term success. Patients' Guide To Understanding Dental Implant Treatment Process from H. Ryan Kazemi, DMD on Vimeo. Anxiety is not uncommon among people having dental implants or other types of oral surgery. This anxiety is mostly related to hearing others’ bad experiences with excessive pain, swelling, or complications. We resolve this in several ways. First, the use of IV sedation allows patients to nap during the surgery. This helps greatly to make them comfortable and reduce anxiety. Second, patients will be cared for by a group of friendly and professional staff members who take the time to personally connect with each patient and allay their fears and concerns. Third, the surgery is done conservatively, which minimizes or avoids swelling, pain, and complications. Life-time guarantee* (*Should the implant develop any problems at any time where it requires replacement, there will be no cost to you. This is extremely rare as our implants have 99% plus success rate. We use only the most well known and researched implant companies in our office, including Zimmer, Biomet (3i), and Nobel. We do not use the lower quality and cheap dental implants, that are available in the market. These cheaper implants, which are often sold to general dentists, do not have adequate research and literature behind them and their composition and manufacturing process is unknown. We do not recommend the use of such implants as they are unpredictable and may be associated with an increased risk of failure, infection, fractures, and poor healing. Dental implants and related bone grafting procedures are typically not covered by any insurance plans as they are considered elective and not medically necessary. If you have a plan with possible benefits we will be happy to submit a pre-authorization letter and form on your behalf. For this we will need to see you for examination and obtain an X-ray. Dental implants may be covered under medical insurance if teeth loss is related to a traumatic injury or pathology such as bony cysts. Contact your insurance company or call us for assistance. We have several payment options including short- and long-term plans. Those with insurance may choose to pay the surgical fees and receive reimbursement directly from their insurance company, or pay an approximate co-pay and we will submit the necessary claims. We accept all forms of credit cards, personal checks (with two forms of ID), and cash. If you need special assistance for payments, we recommend a separate consultation appointment rather than scheduling your consultation and surgery on the same day.